Welcome to November! November is a lovely month. No huge events. No first day of school, no Thanksgiving dinners, no Halloween, no Christmas concerts, no Christmas shopping, just our regular scheduled activities, that we are used to, finally. Sigh. I sound like such a crumungun. But I’m not. I’m just an extremely anxious and scatterbrained person. It’s a bad combination for big events. Its going to be a great month for sewing. I have 4 projects planned for the 4 weeks of November. 1) the challenge Jammies, with a real fly front, and snaps in the fly! Exciting! 3) the onsie with feet out of fun fur! I’m terrified of this fabric. But I promised. 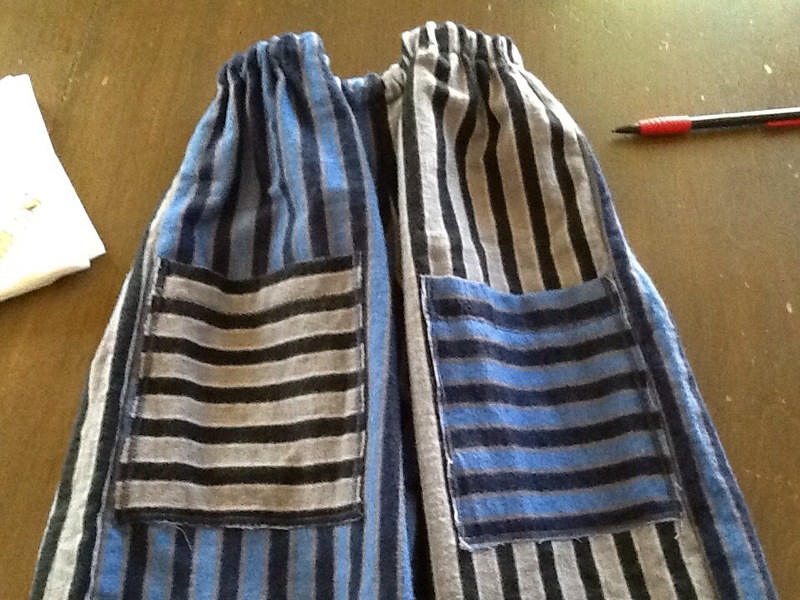 4) Dylan’s Jammie pants and the matching Jammie pants for his 2 American Girl Dolls. This is an old project I abandoned a long time ago because of comments I took personally from the peanut gallery. Snow is on the ground, and cozy fabrics are in my sewing pile. I’m excited! I seem to have forgotten to blog on these pants! And I had so much fun making them! 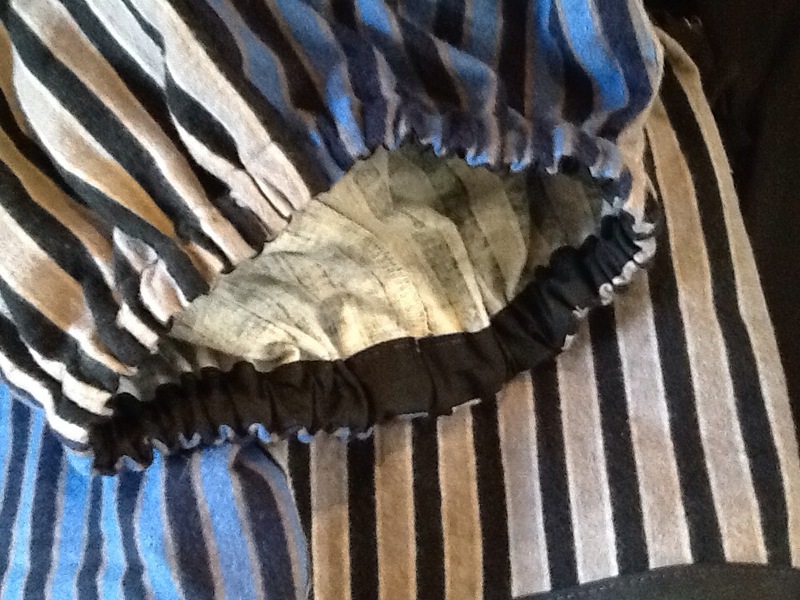 After cutting out the baby’s lady bug pants one piece at a time, I decided cutting fabric single layer wasn’t so bad. So I gathered up these flannell remnants I had. I cut out each front and each back single layer, making it the opposite of the piece before. One thing you HAVE to remember to do when doing this, is to flip your pattern piece face down for half your cuts and face up for the othe half. Or, you will end up with two right fronts and no left fronts etc. 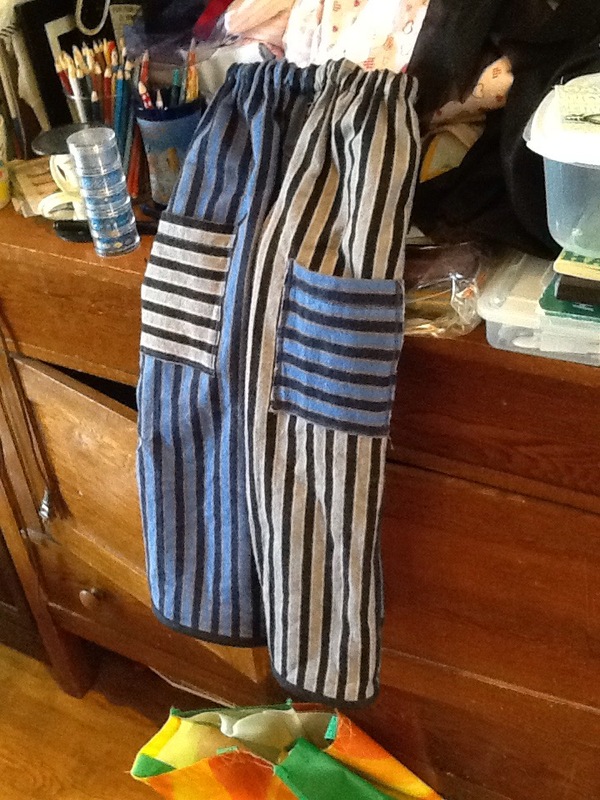 I didn’t really have enough to make full length pants, so I hemmed them with bias tape so as not to lose any length. Did I mention how much I love using bias tape on everything? Lol. 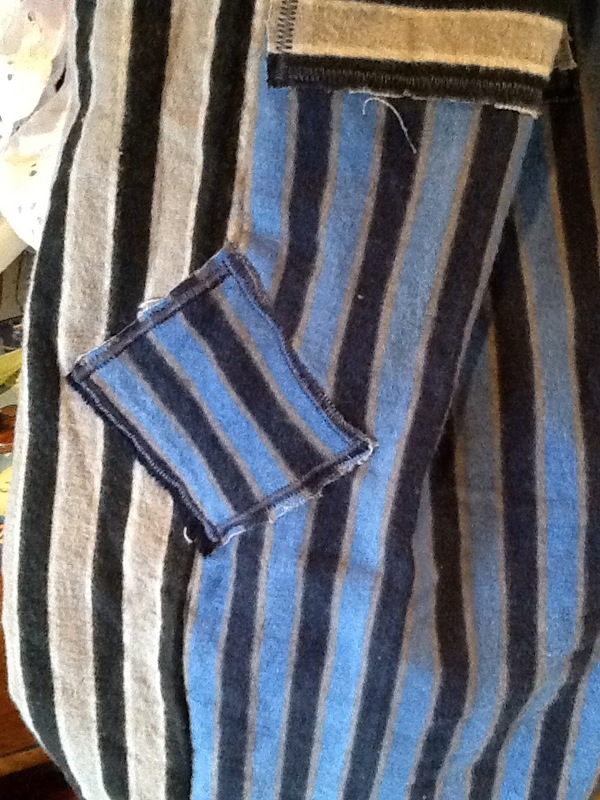 Then I cut out the pockets from the extra scraps. I even added a silly patch to one side to make the pants even more pirate like. The pj pants are just so silly and fun. I want to hug my kid every time he wears them, because he is so darn cute in them! Especially when he shoves his hands deep into his front pockets and scowls. How to smile every time your offspring has a temper tantrum? Super cute pants, of course! 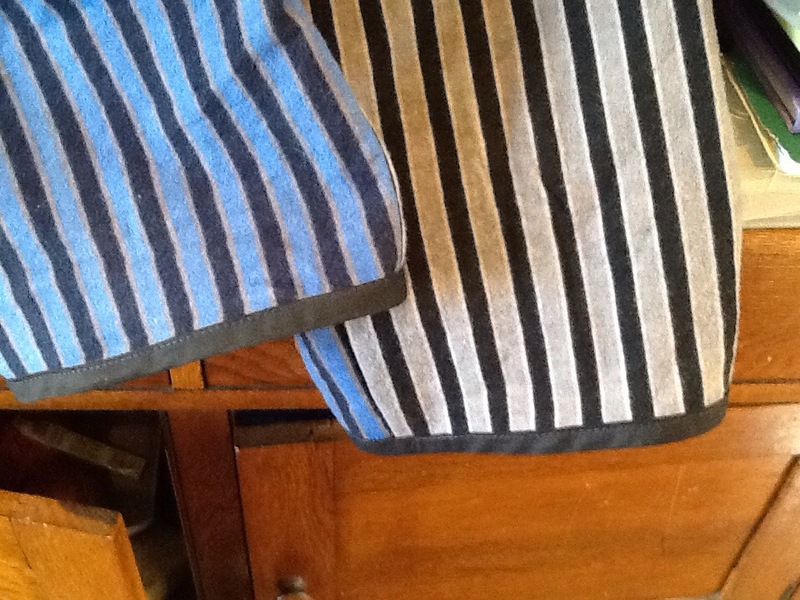 These pockets are going to look even cooler after they are washed and dried a few times. 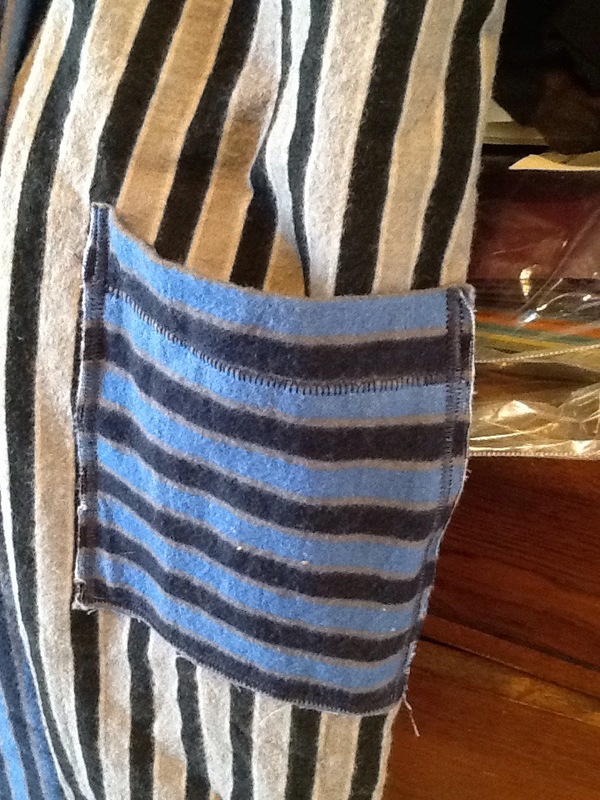 The close zig zag will prevent fraying, and the edges will be soft, like a great favorite pair of old cut offs.